The digital economy is highly volatile and uncertain. Ever-changing customer needs and technical progress increase the pressure on organizations to continuously improve and innovate their business processes. The ability to anticipate incremental and radical process changes required in the future is a critical success factor. However, organizations often fail to forecast future business process designs and process performance. One reason is that Business Process Management (BPM) is dominated by reactive methods (e.g., lean management, traditional process monitoring), whereas there are only a few future-oriented approaches (e.g., process simulation, predictive process monitoring). 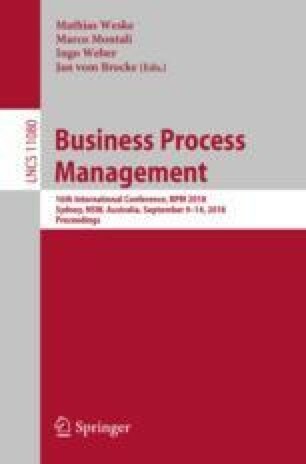 This paper supports the shift towards proactive BPM by coining the notion of process forecasting – an umbrella concept for future-oriented BPM methods and techniques. We motivate the need for process forecasting by eliciting various types of process forecasting from BPM use cases and create a first understanding of its scope by providing a definition, a reference process, showing the steps to be followed in process forecasting initiatives, and a positioning against related BPM sub-areas. The definition and reference process are based on a structured literature review.